Tazza; silver-gilt; embossed and chased; Patience in landscape; border of strapwork scrolls etc; inscribed. ; knop chased in relief with festoons, lion masks, etc; inscribed. ; foot similar to border; bottom of foot with convex plate engraved with arms of Count von Thun of Bavaria; inscribed. Origin: Mark of Paul Hübner; Augsburg, c. 1595. Commentary on this tazza: The three versions of the Patience relief - the 1590 large version (Seling 1980, p. 254, fig. 210), the 1594 smaller version (Seling 1980, p. 254, fig. 205) and the Waddesdon Bequest example (Seling 1980, p. 254, fig. 213) - are essentially not dissimilar and, as Dr Weber has established, the 1590 version derives from the woodcuts of Jost Amman, as recorded in the posthumously published ‘Kunstbüchlein’ (Weber 1970, p. 342). 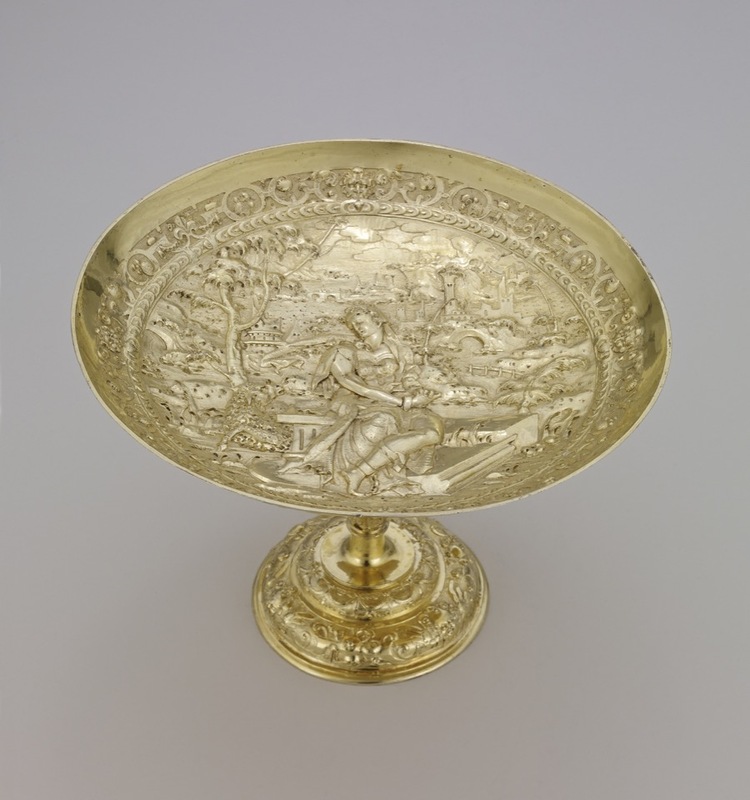 However, Paul Hübner has introduced a number of significant minor changes in the 1594 smaller version, and the Waddesdon Bequest tazza is much closer to the 1594 version than to the 1590 tazza in the Palazzo Pitti. Once again, the comparison leads towards the conclusion that the 1594 set and the Waddesdon Bequest have much in common, while remaining quite distinct. Hugh Tait, 'Catalogue of the Waddesdon Bequest in the British Museum, II : The Silver Plate', British Museum, London, 1988, nos. 24 - 35, pl.VIIIA, figs. 155-178.